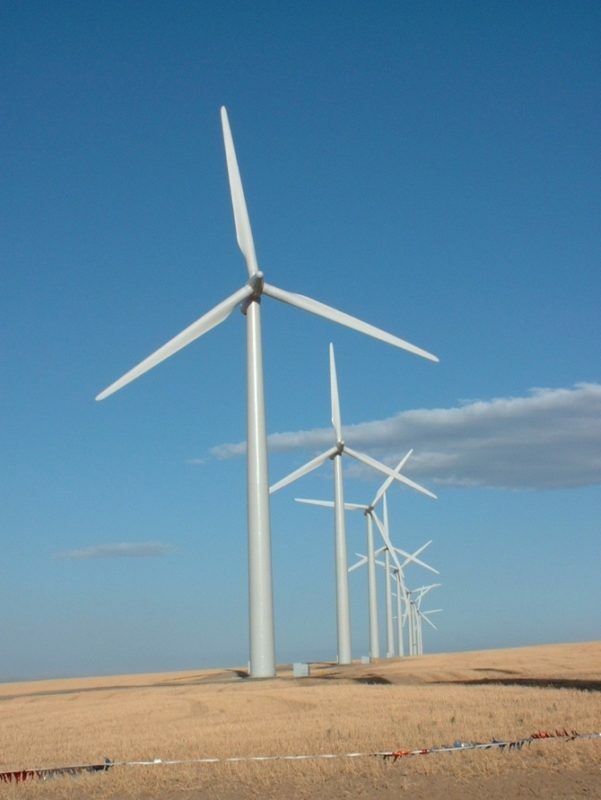 On Sept. 25, 2002, Phase I of Energy Northwest’s Nine Canyon Wind Project, comprised of 37, 1.3 megawatt turbines began producing clean energy for the first time. Nine Canyon, located approximately ten miles southeast of Kennewick, was developed in three phases and today features 63 wind turbines that produce up to 96 megawatts of renewable electricity. At the time Phase I of Nine Canyon was being developed, it was considered the largest public power-owned wind project in the nation. Phase II added 12, 1.3 megawatt turbines in 2003. Phase III came online in 2008 with 14 larger turbines, capable of generating 2.3 megawatts of electricity each. The power from Nine Canyon is provided at-cost to the following participating Energy Northwest member utilities: Benton County PUD, Chelan County PUD, Cowlitz County PUD, Franklin County PUD, Grays Harbor PUD, Lewis County PUD, Okanogan County PUD, Grant County PUD, Douglas County PUD, and Mason County PUD 3. Nine Canyon Wind Project, located near Kennewick, Washington, is one of the largest public power owned wind projects in the nation. It consists of 63 turbines, driven by the wind. Each three-blade turbine consists of a tubular steel tower and three giant turbine blades attached to a rotor, and a nacelle which houses a generator, gear box, and braking mechanisms. The 63 turbines are placed in four rows, along the windiest ridges on the site. Although the project lease covers 5,120 acres of land, only 47 acres are actually taken up by turbines, access roads, and a maintenance building. The project lease guarantees the landowners an annual income for the life of the project. Phases I and II of the project include 49 turbines each capable of producing 1.3 MW of power each. Phase III consists of 14 larger turbines each capable of producing 2.3 MW of power each. Siemens shipped towers, blades and other components to the Ports of Longview (WA). The cargo was trucked to the project site. We have a 2.08% off-taker agreement for Phase I and II. We have a 15.7% off-taker agreement for Phase III. Together we have a roughly 6 megawatt (MW) share of the project. We can expect roughly 14,137 RECs per year from the project that can be used toward the I-937 requirement.